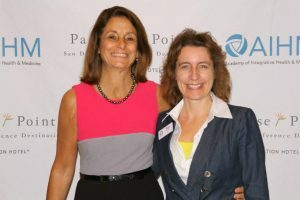 Dr. Guarneri, Founder and President of the AIHM, is pleased to present this ground-breaking two-year hybrid program from the AIHM --the first graduate level training program designed for clinicians across of range of professions. You will be immersed in an innovative, interactive clinically-focused curriculum designed to enable you to quickly put into practice what you learn. You will gain a new perspective on integrative models of care while working side-by-side with clinicians and faculty from a diverse group of professions. 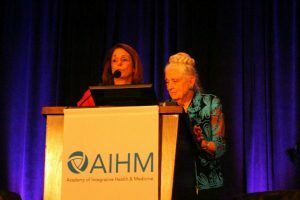 The AIHM Interprofessional Fellowship was unanimously approved by the American Board of Integrative Medicine (ABOIM) in 2015. Medical doctors (MDs) and Doctors of Osteopathic Medicine (DOs) who successfully complete the two-year training program are eligible to sit for the ABOIM board speciality in Integrative Health and Medicine. During the Fellowship Program, there are three weeklong Residential Retreats in beautiful Portland, Oregon. The Retreats are a foundational aspect of our program and provide Fellows with the opportunity to meet and connect with classmates, faculty and staff. Each retreat is filled with engaging classes, hands-on workshops, self-care opportunities, delicious meals and reinvigorating quality time together. Fellows bond with one another as they broaden their vision and deepen their knowledge of Integrative health and Medicine in a truly collaborative and supportive environment. The AIHM’s Academic Partner is Oregon Collaborative for Integrative Medicine (OCIM), a non-profit organization with membership composed of the National University of Natural Medicine, Oregon College of Oriental Medicine, Oregon Health & Science University, Pacific University and the University of Western States. For more information, please view the AIHM Fellowship Program Details or contact the Chair of Student Services at fellowship@aihm.org or call 858-240-9033 x1000.